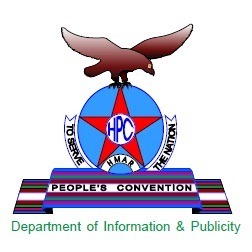 Aizawl, Apr 19 : Manipur-based underground outfit Hmar People's Convention-Democratic (HPC-D) is at loggerheads with the central Young Mizo Association, with the outfit serving dissolution order to all YMA branches in the HPC-D demanded area in north and northeastern Mizoram. Reacting to the outfit's diktat, the central YMA today informed all the targetted branches to defy the diktat and not dissolve the YMA branches. Taking a strong exception to central YMA president's reported remarks in a public meeting at Ramhlun Sports Complex on January 30 last, the HPC-D said in a press statement on Tuesday that the HPC-D "forcibly dissolved" all YMA branches in the HPC-D demanded area. "The HPC-D will not be responsible for any untoward incident that may befall office-bearers of the YMA branches that defy the dissolution order and continue to function," the release said. According to the HPC-D's handout, central YMA 'president' T Sangkunga, in his public speech, expressed outfit's strong opposition to any attempt to upgrade the Sinlung Hills Development Council to an autonomous district council status. The HPC-D construed the central YMA president's remarks as "derogatory" to the Hmar community and "detrimental" to unity of different Mizo tribes as a whole. It accused the central YMA of not accepting non-Lusei speaking people as Mizos.